Nobody is going to tell you you’re good enough, and nobody is going to offer you the gig you see in your head: You have to get out there and make it happen. I’m always banging on about how you need to get gigs to really learn DJing – and unless you’re one of those DJs who’s happy messing around in your bedroom doing mixes for only yourself to hear, I stand right by that: No crowd, no deal. DJing is done in public. It’s a two-way thing, and it can’t be two way if it’s only you there. Thing is, to get those gigs, you need to hustle – and many people aren’t at all comfortable with that, especially beginners. “I’m not good enough!” they say. Well sorry, I’m going to hit you with it: You’ll never get good enough unless you get out of your comfort zone and land those gigs. 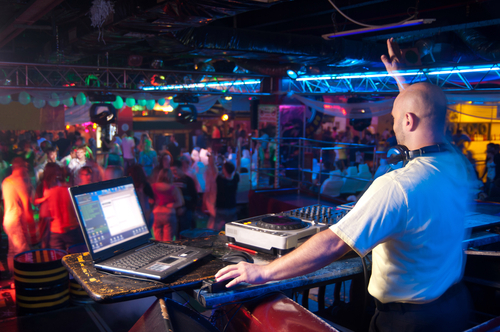 Luckily, you don’t have to be an amazing DJ to start playing in public. The important thing is that you need to start. I’m going to tell you some of my own story, and then introduce you to two other DJs – Elliot and Peter – to show you exactly what I mean. About four years into my “club” DJing career, I was running my own club night, playing every Saturday to 500+ people. I was a fully professional DJ and promoter. I was paying the club hire fee, the doormen, the other DJs. I was making enough money to be buying my own house from what was left over. I was in touch with agents and booking big names, who were playing alongside me. Other times, when we had no big names playing, I would play the night either with my resident DJ partner or even on my own. Our crowd was loyal, and people often commented that the resident-only nights were better than the guest DJ nights! So let’s be honest – nobody could have said that I wasn’t good enough. There I was, doing it, week in week out. The proof was there for all to see – I’d “made it”. But actually, there was one voice telling me I was a fraud, that I wasn’t a real DJ, that I should give it all up before really embarrassing myself. The truth was, I didn’t think I was good enough, I didn’t think I was ready. I did feel like a fraud. And you know what? I’ve since learned that this is a perfectly normal, natural way to feel. The best artists feel like it. It’s what gives you terrible nerves before performing, making you horrible to be around. It’s what has you waking up at night, sweating and dreaming about empty dancefloors and people laughing at you. It unfortunately seems to come hand in hand with doing something creative for a living or for a hobby – whatever that may be. And this happens whether you’re a beginner or already a success. I’d felt exactly the same way four years earlier, when I played my first faltering gig in a small local bar. 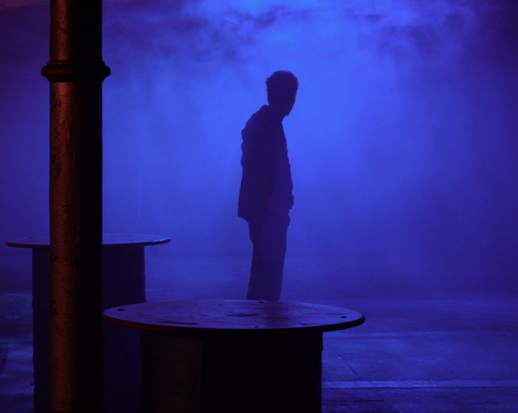 (The night was called “Testarossa”, and it was in a basement bar two doors up from Manchester’s Hacienda club. These details never leave you.) That time, I was so nervous, I had my set list written out on a tiny card hidden from public view – a card I could hardly read because my hand shook so much for the whole hour I was DJing. Elliot was a quiet guy, but he could talk to you for hours about samples, and synthesisers, and producers, and record labels. He has a meticulously organised record collection (I remember he used to number his vinyl and keep it in the order he’d bought it in, month by month). He was one of the few people I knew who had real Technics record decks (he’d saved for years). We all looked up to Elliot for his genuine passion for the music. If you’re truly happy being a bedroom DJ, then nothing I have to say here applies to you, and I apologise for wasting your time. But if not, then this is how to make a change. Sadly, Elliot never once to my knowledge played outside of his house. “He’s a great DJ, he just needs a break,” people would say. “It’s just that nobody wants to give him one.” But breaks don’t come to you. You have to go and find them. Some people are so purist they just can’t bring themselves to engage with the real world, to meet it half-way, to get a dose of reality and to see where they might be able to fit in. And who can blame them, really? It’s hard out there. Nobody cares about your “brilliance”. To get a go, you need to hustle. You need to see openings. You need to take a deep breath and begin to believe. You need to invent your reality. You need to project forward a bit, be a bit cocky. Yeah sure, you may need to take gigs you’re not completely comfortable with, but ultimately, you have to write your own story here. It’s DJing, not a college course. There’s no path for you to follow, nobody ticking your boxes as you complete each stage. To an extent, you have to believe your own hype. Elliot wouldn’t see it, and he didn’t get anywhere. Let me ask you an uncomfortable question. Have you played a public gig yet? How long have you been DJing? Repeat after me: I am not a charlatan! Hang on, you may say. If I’m just beginning, surely to throw myself in front of an audience is wrong? Even if I can conquer the nerves, doesn’t that make me a charlatan? Trust me, you’re not a charlatan. It’s time to meet our second DJ, Peter. He was. And I’m pretty sure you won’t see yourself in him. I actually knew Peter around the same time as I knew Elliot, right at the beginning of my DJ career. My friend’s dad owned a successful company. His business partner had a son, and that’s who Peter was (again, I’m not using his real name). Peter was used to getting what he wanted. Buying what he wanted, actually. And he cottoned on to the whole DJ thing. I remember as if it were yesterday a conversation I had with Peter, a conversation that made me sad and angry. “I don’t know why you’re bothering with all of these bar gigs,” he said, pityingly. “I’m going to do some DJing. It looks cool. I’m going to get myself DJing in a real big club.” And you know what? He did it. He hustled a promoter who had hired a big club for a night, and managed to spend some of his dad’s money and grab the back room for himself. He put on a party. I honestly don’t know how Peter’s party went, but he went very quiet when I asked him about his DJing career after that. The thing was, though, Peter couldn’t DJ, and really had no intention of putting any effort in to learn. He had zero respect for other DJs. He thought it was easy, that anyone could do it. He taught himself to put records on, bought the music everyone else was listening to, and told the world he was a DJ. Probably the only person who thought he was amazing was Peter himself. I honestly don’t know how Peter’s party went, but he went very quiet when I asked him about his DJing career after that, and I never heard of him playing anywhere else. I suspect he lost some cash and didn’t make many friends. I do know he ended up working for his dad as a living. I’m sure he was quite happy, but point is he didn’t make it as a DJ. Peter failed because he was all hype, no practice. Elliot failed because he couldn’t cope with getting himself out into the real world, couldn’t handle the idea of things not going right for him if he tried. But the truth is, as long as you’re in this for the right reasons, there’s absolutely nothing wrong with hustling a bit, and there’s nothing wrong with failing every now and then either, because that’s how you get better. I DJed scores of awful gigs to empty venues on my way to success. But I’ve always liked to look at it this way: Even if you have a howler of a night in public, at least you get to practise on a decent sound system. At least you’re on the field. At least you’ve turned up. If you’re just starting out, my single biggest piece of advice is this: Don’t worry that your DJing isn’t good enough, worry that it’s not happening enough. And we’ve already established where DJing happens: In public. You need gigs in order to improve. And you need to hustle to get them. So while the little voice will always tell you you’re a fraud, let me tell you something else that also always seems to happen when you hustle yourself a real gig: Inspiration arrives. Your practice sessions seem to get a bit more focused. Things start to come together musically. You start to feel just a little bit like a DJ. You get better. Ultimately, the only hustlers who get tripped up are the Peters of this world, and we’ve already seen you’re not one of those. And if you don’t hustle? Well, you may turn out like Elliot. And I’d hate for that to happen to you. 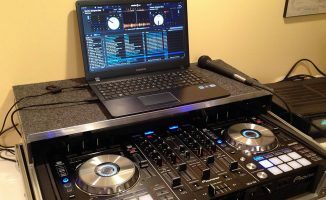 • The Digital DJ Tips online video course How To Digital DJ Fast is designed to teach you the right skills to get you from complete beginner to DJing in public in just four weeks. Read how it’s worked for other people here. How have you managed to hustle your way into DJ gigs? What’s worked for you? Did you wish you’d done it earlier? Are you still building up the skills or nerve to bag yourself that first public show? Please share your stories in the comments. "Help! I've Just Bought My First Digital DJ Kit. What Do I Do Now?" Agreed, be the best hustler, because there are TONS of other DJ’s out there that are hungry for gigs (that may not even have any idea whats going on). And for the show nerves, just think “I’m no-where near as bad as Paris Hilton” and those nerves should be soothed! If you are that bad, just make sure you have a DJ buddy on the side of the stage to adjust your gains. “And for the show nerves, just think “I’m no-where near as bad as Paris Hilton” and those nerves should be soothed!” – wish I’d thought of that line, DNA! Brilliant article Phil…you don’t get that kind of advice in books. DJing is now watered down and it doesn’t even feel special to do it anymore. 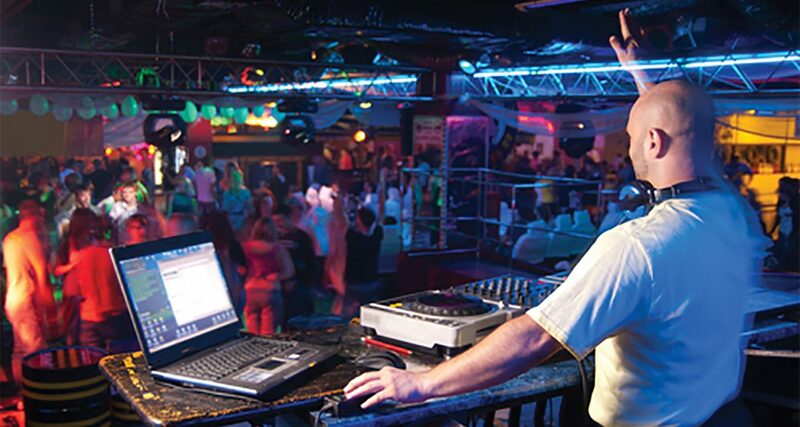 A DJ is an itunes fanatic and gets gigs because he is the brother in law of the bar manager or owner. Time and time again we see it. I’m not against the lapjock with virtual DJ free version playing as long as he or she makes people smile. But it’s watered down the whole thing especially when cheesy chart invades. That’s why a “weird” setup saved my Gigs. Payed better, because I do it better. If you aim for the watery pond of PC & Virtual DJ free & Chart Music & Friend of owner crowd then it’s a one way street to frustration. The only way is to distinguish yourself by doing something different and going for niches. I know it’s not what a lot of people want to hear, but throwing on a couple of free shows or parties really gets your name out there. I did a friend’s house parties a couple times and people came up asking for my card. I was able to play what people wanted to hear and market myself with a couple of my less popular mixes. I have more business than I thought I would ever accomplish with something that looked cool and became a hobby. I always say “You don’t get gigs because you’re a good dj, you become a good dj from getting gigs”. And you’re a good DJ when the Gigs comes to you ! i would like to get some gigs but i keep thinking something that dont seem to get mentioned much on here,,that in the uk at least dont you need a pro dub licence,and have your gear pat tested,and do you need public liability insurance or is that just something mobile djs need. In theory, you need a Pro Dub licence if you rip CDs and play the digital copy, in practise ignore it! It’s a big wheeze and nobody’s ever been prosecuted for not having it. Public liability is needed for mobile guys. You’ll be ok in most instances. Don’t worry about either. Any reason you didn’t give Elliott his break when you ran a night? Good to hear it Acker, and I wish you the best of luck. Why not try going to dose clubs and ask if they be interested in trying a night with your style of music. I’ve seen that often people don’t realize that you actually can dance to some music until they are on the floor 😀 I’ve played Korn/skrillex song and everyone was dancing 20 to 50 years old people. Most people don’t listen the same way to music in a club as on the radio. go ask the worst thing that can happen is they’ll say no. Good idea, i guess i should try that. Thanks for the advice Gulli. Good work Callum, nothing beats it! Thanks Phil, I needed this article. I was once up-and-coming and had residency at a club and then the club I was working at closed… the rest of the clubs playing my music style wouldn’t ever respond to my requests for playing so I just… stopped asking and stopped playing to anyone but myself (and my girl). I guess the most important follow up to this article would be “HOW” do I ask for gigs without nagging and so I actually get a spot? I started DJing in the late 80s/early 90s, then had a break to raise a family. 3 years ago, I was in the right place at the right time, and got offered a tryout at a retro club playing the same music I used to play all those years ago! It took a lot to get up in front of a crowd at age 40+ after more than 15 years away from performing, but I’m so glad I had another go. I’ve been a resident there ever since, and I still get nervous before every set. Top article Phil, and so true. 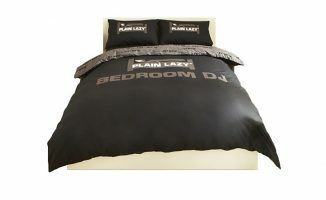 Indeed… An importent read for any DJ who what’s to move from the bedroom. Great artical Phil , You could be describing me lol . I had a lucky break and have a weekly show on http://www.redseadanceradio.com but i still get nervous when i produce the show . I would love to play to a crowd but yes i have that voice in my head are you good enough what if i fail etc etc. Glad to have helped Neil, keep in touch now you’re here! Thanks for broadening my vocabulary. I had to look up the definition of “charlatan”. Good article. I let my imagination and fears get the best of me often too. I have learned 90% of the work is just showing up. Sound quality will be fine, you plug into any spae channel on the club mixer, and you plug into the CD channel of the CD player he ISN’T using (ie the other one!) while he’s playing his last CD, so you can mix into it. We cover all of this in How To Digital DJ Fast, by the way, in bigger detail. Thanks for sharing Zameer, and I’m so pleased your crowd is building. You start your own event in literally the tiniest venue you can find, and find the few people who are interested in what you like. I’ve played 4 empty rooms in the past month. I got booked again for the next two weekends because I showed up on time, acted professionally, played my music like the house was full and TOOK REQUESTS. It is not easy to stay enthusiastic when the only people listening are the bartenders but the music is loud, the stage lights are on and it all adds up to better things down the road. 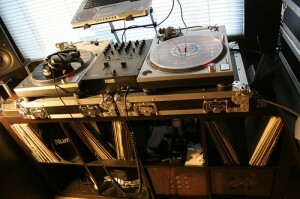 (DJing since Jan 2011). And yet… surely it’s better by far than doing the same thing in your bedroom. Thanks for sharing David. digital DJs feeling like they’re soehow not “worthy” is a big thing we come across time and time again. It’s one of this website’s missions to counteract that! I am only 13 and started djing because I love music. I want to get out there but I’m not old enough to be in a club. I want to be the best I can so how can I get in public? Thanks for any help. You should think of the positives – your 32 years of experience gives you things 20 year olds don’t have, like a broader musical knowledge to start with, and probably (generalising a bit here) the ability to plan slightly longer time with a bit more direction than someone younger might. Thanks Phil. You sort of been like a big brother to me in a sense with this whole life change I’m starting to get into. I tried contacting you b4 via this website I even spoke with the gentleman who I purchased the wedding guide through your site and asked him I said hello. Is there some other way we can contact you with questions or tips? Anyone got any advice on creating a mix tape? How long? Whole songs? How many songs? I have just started out and just done a couple of weddings, but would like to try playing some bars as I hope I will be able to play music I am more interested in. Also I have not mastered beat matching by ear yet. Should that stop me or should I go for it anyway? Try and master all the skills “on the job” – it’ll come faster that way. Thanks, will check it out. Also I have started your how to dj fast course and finding it great. Phil I don’t know how you do it but you manage to hit the nail on the head in so many articles. I love that there is a blog like this that is covering more of the mental (even philosophical?) side of DJing. Keep it up. You will very rarely get asked for a demo. They want to know how many people you can bring, or for a small bar gig, how reliable you are and how well you already know their venue. 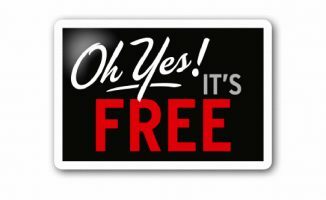 Get your name on a flyer, slap a mix up online, do a business car if you want, then get out there. Im just starting out and Ive been feeling like this is impossible and how am I ever going to learn and to start DJing in clubs and bars. This was a really inspiring post. I learned a lot just from reading this. Great article. I just started myself. Thx! I started to mess around with djing and turntablism at 16. By 22, I lost the passion and sold all my gear (a very depressing time). Now, 5 years later (27yrs old) I’m just getting back into it again. I enjoy it more than the first time around. Cut a long story short, from 16-22 years old, I only played 2 gigs. Back then I was always the biggest critic of my ability. Now, I’m itching to get gigs and play out whether or not I make mistakes! Excellent to hear, and I hope you get many more gigs this time around. Am Elliot 🙂 But Great article!!!!!!!!!!!!! Thanks for that truly inspiring story, and I agree completely with your sentiments – it’s not the gear, it’s the passion. Love it! A true warrior. 🙂 I agree – playing your music in public, is reward enough at times. Truly inspiring. Write ten books. Well I want to have my first gig, but I don’t have any Idea how to get one? maybe I should walked in to a bar or club, and audition if i can be a DJ for the night? any tips for me I was like elliot I don’t have any believe in myself quiet guy, doesn’t know how to hype but thanks for this idea.